33 A None No Power Seat 33 A is an Economy Class seat which does not recline due to the exit row behind. 33 B None No Power Seat 33 B is an Economy Class seat which does not recline due to the exit row behind. 33 C None No Power Seat 33 C is an Economy Class seat which does not recline due to the exit row behind. 33 D None No Power Seat 33 D is an Economy Class seat which does not recline due to the exit row behind. 33 E None No Power Seat 33 E is an Economy Class seat which does not recline due to the exit row behind. 33 F None No Power Seat 33 F is an Economy Class seat which does not recline due to the exit row behind. 34 A None No Power Seat 34 A has extra legroom due to the exit row. 34 B None No Power Seat 34 B has extra legroom due to the exit row. 34 C None No Power Seat 34 C has extra legroom due to the exit row. 34 D None No Power Seat 34 D has extra legroom due to the exit row. 34 E None No Power Seat 34 E has extra legroom due to the exit row. 34 F None No Power Seat 34 F has extra legroom due to the exit row. 48 A None No Power Seat 48 A is in the last row of the aircraft and may not recline. Proximity to the lavatory and galley may be bothersome. 48 B None No Power Seat 48 B is in the last row of the aircraft and may not recline. Proximity to the lavatory and galley may be bothersome. 48 C None No Power Seat 48 C is in the last row of the aircraft and may not recline. Proximity to the lavatory and galley may be bothersome. 48 D None No Power Seat 48 D is in the last row of the aircraft and may not recline. Proximity to the lavatory and galley may be bothersome. 48 E None No Power Seat 48 E is in the last row of the aircraft and may not recline. Proximity to the lavatory and galley may be bothersome. 48 F None No Power Seat 48 F is in the last row of the aircraft and may not recline. Proximity to the lavatory and galley may be bothersome. This aircraft offers personal seatback Audio and Video onDemand TV's in both classes on service. AVOD allows passengers to select any channel at any time. All Prestige Class seats as well as every other Economy Class seat have a 110v AC power port. An adapter is not required. 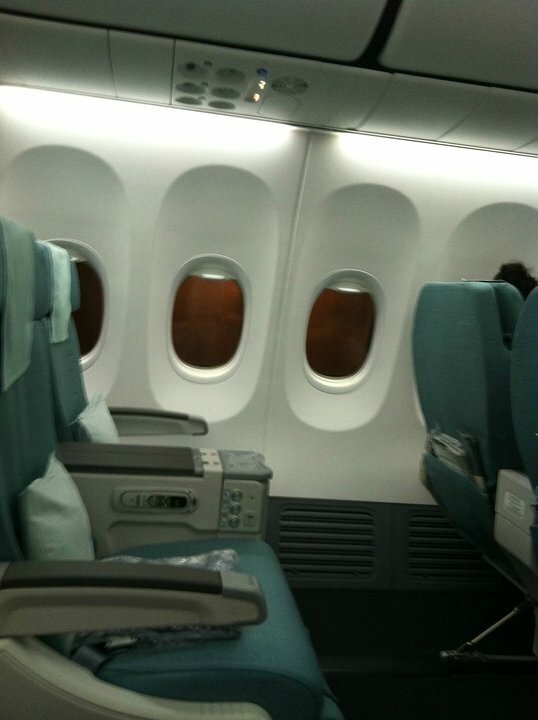 Korean Air operates two versions of their Boeing 737-800 aircraft. This version has 126 seats and offers two classes of service: Prestige and Economy. This version of B737-800 aircraft is fitted with AVOD entertainment and in-seat power ports at every seat. The following rows may be used as reference: Prestige Class are rows 7-9 and Economy ends at row 48.